It’s April, which means you are going to be hearing a lot about Parkinson’s Awareness Month. If you read any other blogs or PD newsletters, you have already been inundated with information. There is a lot happening this month, with many events being planned around the April 11 birthday of James Parkinson. His groundbreaking paper, “The Shaking Palsy”, was published in 1817 and has long been considered the foundational text of the disease. So the good news is that we Parkies are all getting the info about Parkinson’s. The bad news is that the outside non-Parkie world is still clueless. So here we are, 201 years after Parkinson’s essay and most of the world and many Parkies believe that there is nothing that can be done to improve our outcome. And many still think of an old man bent over, shuffling and trembling when they hear the words Parkinson’s Disease. So it is our job to change that perception. We may not yet have a cure, but scientists and researchers seem to be getting close. There are many new theories about what causes Parkinson’s that are very promising, and one of them might just lead to a treatment that could be a cure. As people with Parkinson’s, we must demand the best treatments available to improve the quality of our lives. And to do that, we must be educated consumers. Here are a few things that you can do this month to learn more about Parkinson’s and to raise Parkinson’s awareness. I tried to include a few new things that you may not already have read about. Join the #UniteforParkinsons campaign. This campaign was originated in England with Parkinson’s UK and the European Parkinson’s Disease Association (EPDA), but is now a global campaign. Post a photo or video of you on social media with a sign with the words I #UniteforParkinson’s because ……. (you fill in the blanks) Please post them on the Twitchy Woman Facebook page as well as your own FB page, Twitter, or whatever social media you are using these days. Let’s see how many we can get this month on Twitchy Woman! There is also a guide for the campaign which has many ideas that you can use. Share your story and inspire others. Participate in a local walk. The Parkinson’s Unity Walk takes place in NY on April 28. There are many other walks, runs and other activities going on around the country. Check with your local organizations to see what is happening in your area. This one I just heard about and it sounds fascinating. Log onto INSIGHT 2018, Wednesday 11th to Friday 13th April for World Parkinson’s Day. Join the first online World Summit and discover how to live your best life possible – because of and in spite of Parkinson’s. 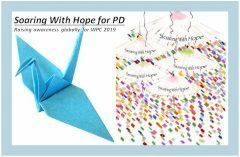 Connect with experts, academics, specialists, clinicians and people living with Parkinson’s who are trying to live their best life possible. Become a Patient Advocate for any of the Parkinson’s organizations. They will train you to reach out to elected officials, speak at public engagements and more. Another interesting concept is the formation of Patient Advisory Boards for pharmaceuticals and other companies. They want to hear from us about what we want to treat our Parkinson’s and see us as part of the team from start to finish in developing new drugs, clinical trials, etc. In Los Angeles, where I live, the Parkinson’s Community LA is having an event titled “Living Artistically with Parkinson’s” featuring works by people with PD. All pieces will be for sale by silent auction and will benefit the artists and PCLA. About 18 months ago I wrote a blog titled Breast Cancer vs. Parkinson’s in which I lamented about the fact the Parkinson’s Awareness Month was nothing compared to Breast Cancer Awareness Month. Let’s try to change that perception together, today!